Sjögren’s syndrome affects approximately 1 in 200 Americans. It is critical for patients who suspect they may be suffering from Sjögren’s syndrome to be evaluated by an team of specialists experienced with this disease. 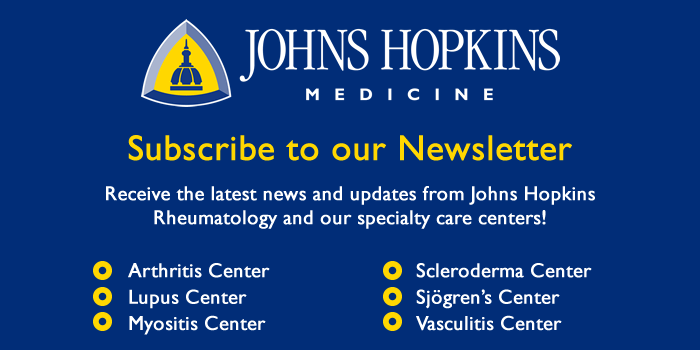 The physicians at the Jerome Greene Sjögren’s Syndrome Center at Johns Hopkins have extensive experience in the diagnosis, management and research of Sjögren’s syndrome. Their expertise is now gathered in one center, conveniently located at the Johns Hopkins Bayview campus in Baltimore, Maryland. Our team features a rheumatologist, ophthalmologist, neurologist, and gynecologist who evaluate 200-300 new patients a year with a suspected or confirmed diagnosis of Sjögren’s syndrome.